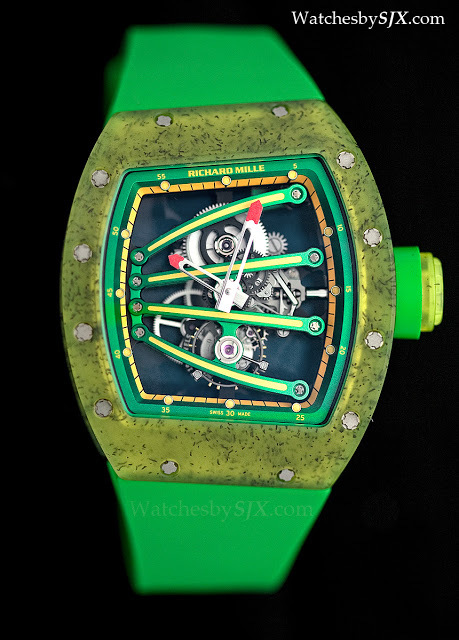 Richard Mille presented a headline grabbing collection of watches, each designed for a particular celebrity friend. 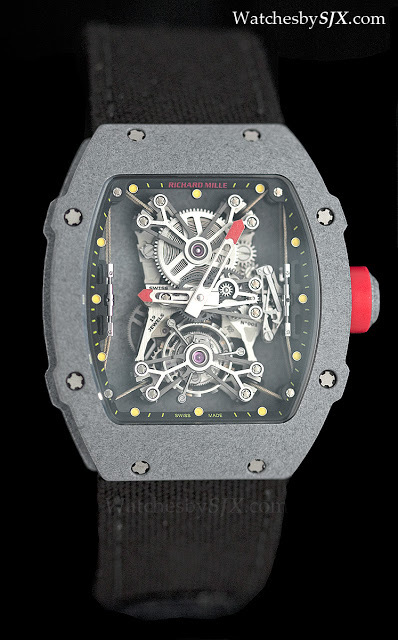 The biggest headline definitely belonged to the smallest watch – Richard Mille topped his previous record of lightest wristwatch with the new RM027-01 Rafael Nadal, which weighs just 19 g, inclusive of the velcro strap – the earlier RM027 weight 13 g without a strap. 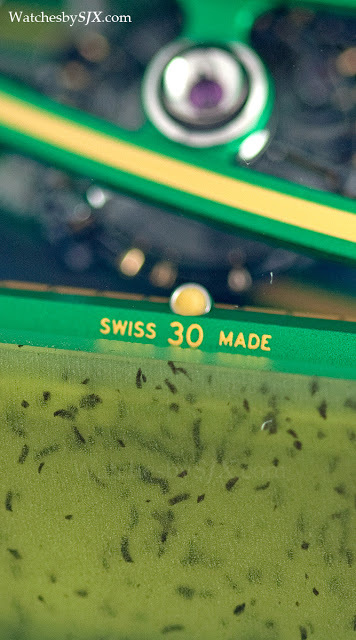 The case of this 50 piece limited edition is a polymer with carbon nanotubes. 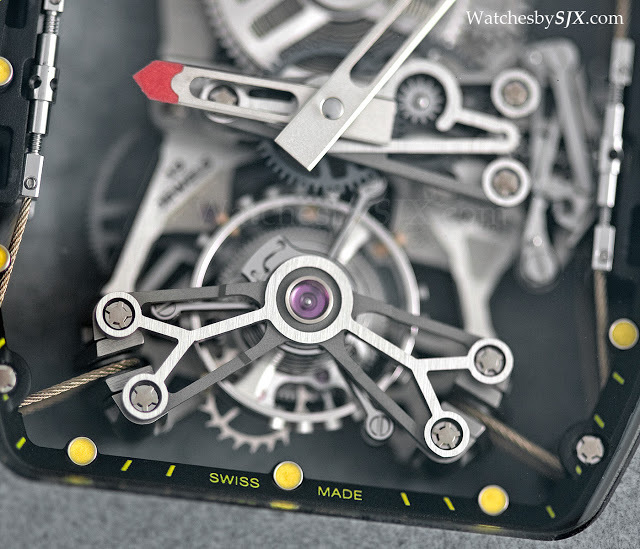 Weight aside the other notable feature is the steel cables which secure the movement to the case, resembling a pulley system. 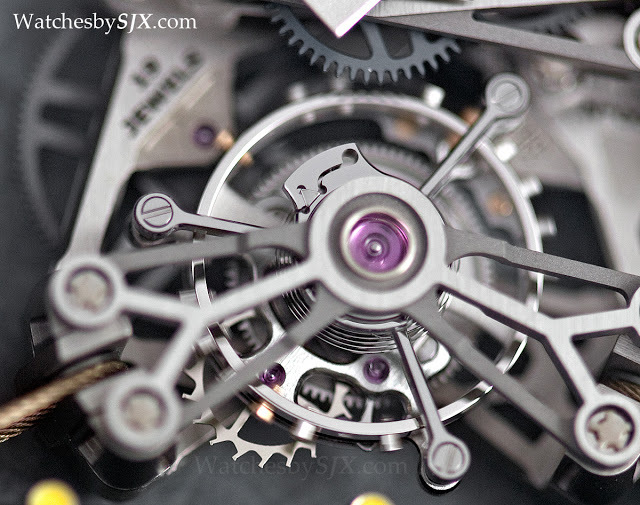 These cables are attached to two tensioners on each side of the movement; these are tightened during assembly once the movement is in place. 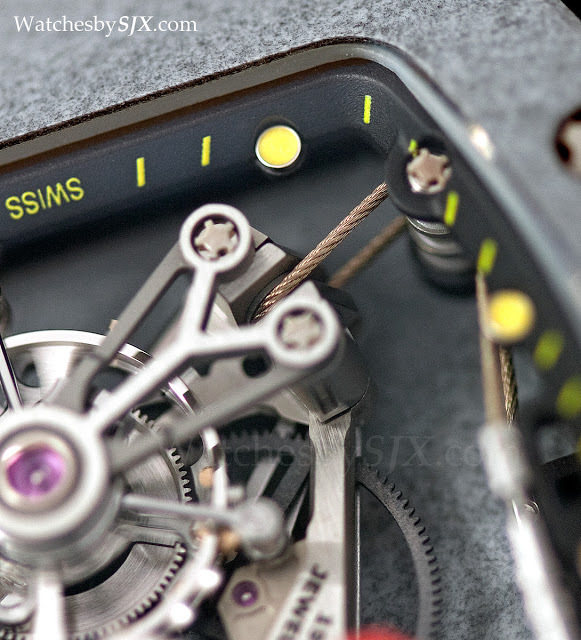 The movement base plate is titanium, while the bridges are an aluminium-lithium alloy. 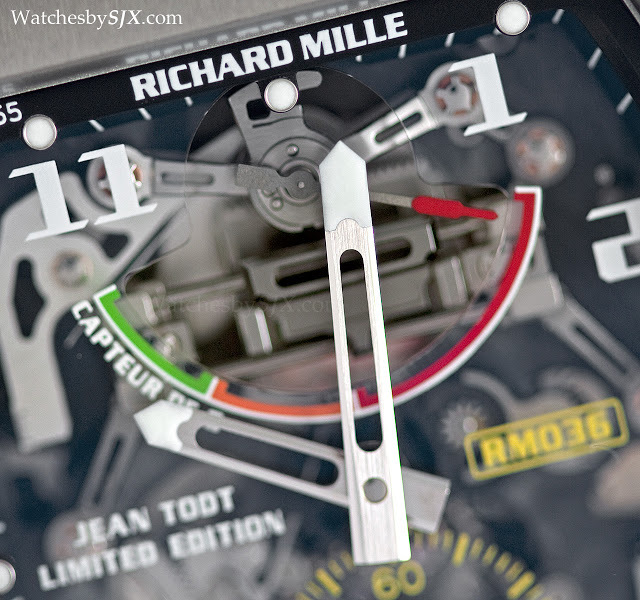 The watch is slightly smaller than most Richard Mille tourbillons, measuring 45.98 mm by 38.90 mm. 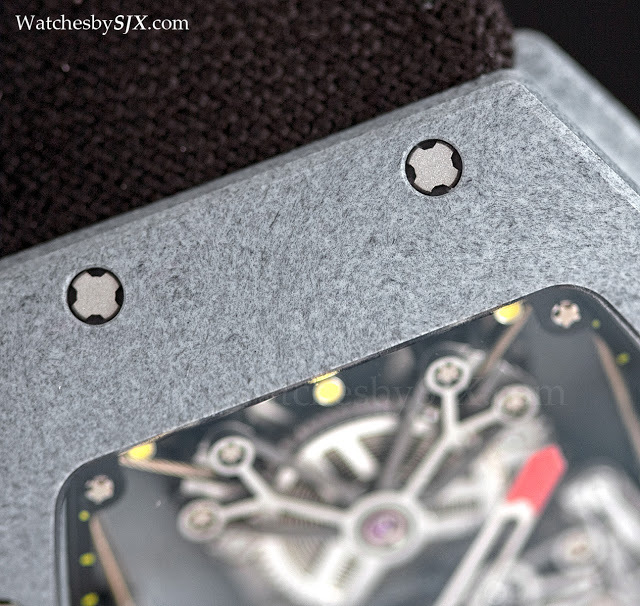 In person the watch is unbelievably light, but the case colour and texture feels plasticky. 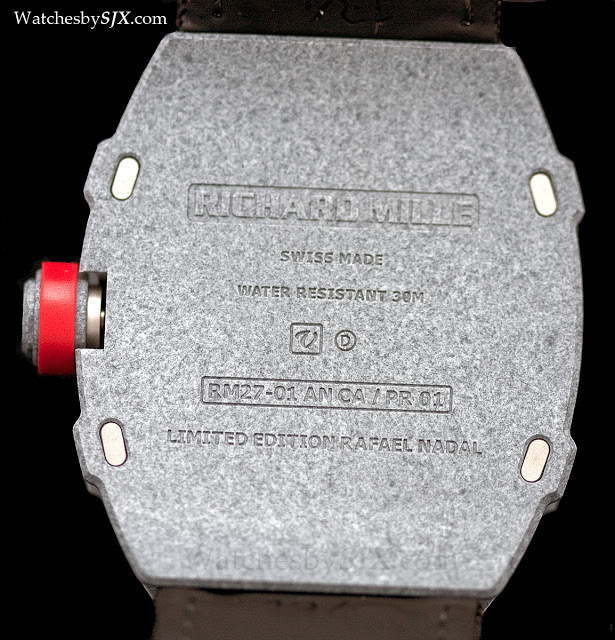 The rest of the new Richard Mille watches adhere to the new model numbering system as well. Each new model is grouped into a particular family, e.g. 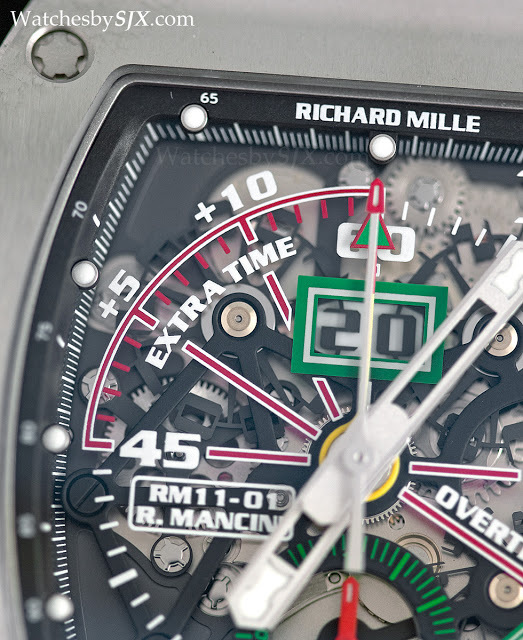 RM027 for the ultra-light Rafael Nadal watches, followed by a suffix denoting the specific model, hence RM027-01. 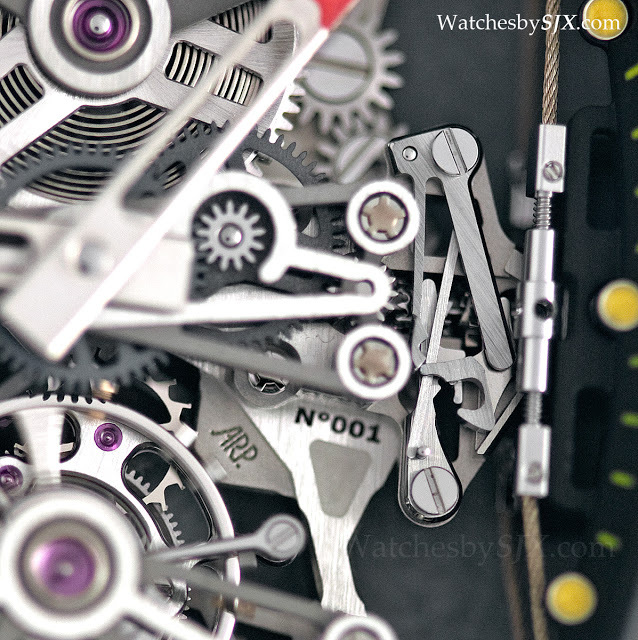 The aim of this is to keep the model codes small and manageable. 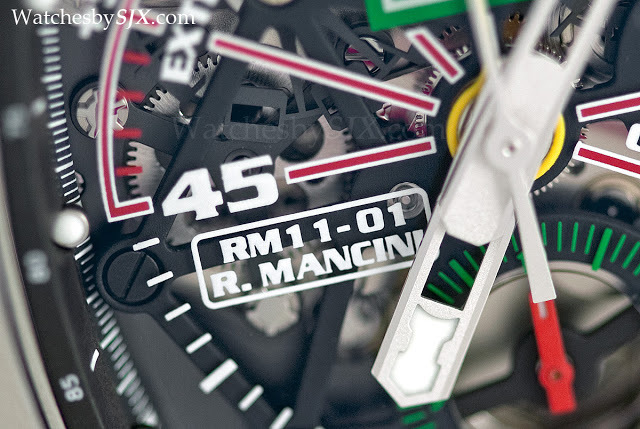 Hence the RM011-01 Roberto Mancini Chronograph Flyback is part of the RM011 line. 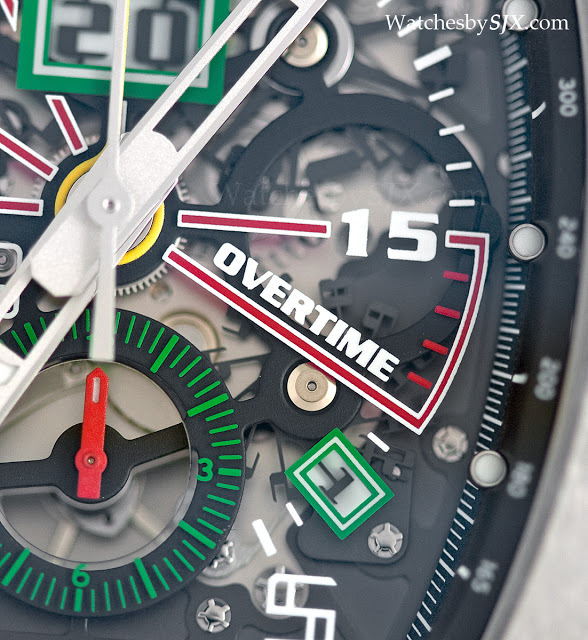 This is a flyback chronograph with annual calendar, but the dial has been redesigned to enable timing for a football match, two 45 minute halves (activate the flyback to reset to zero and start the second 45 minute half) and up to 15 minutes of extra time. 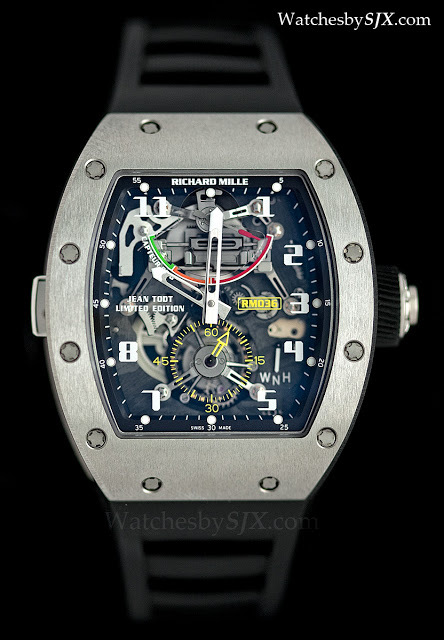 According to RM, this was designed at the request of Roberto Mancini, coach of Premier Leagure club Manchester City. 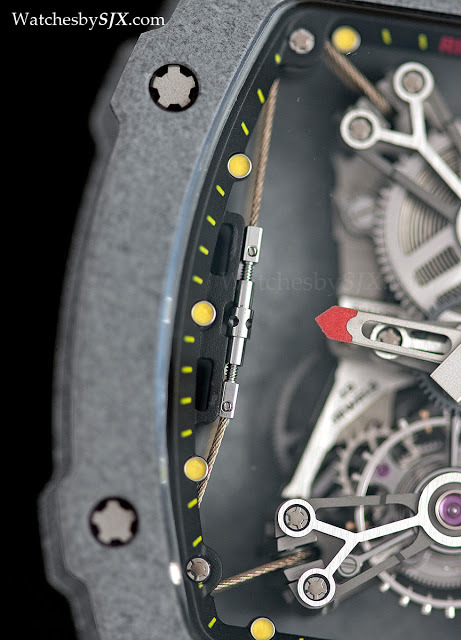 Likewise, the RM058-01 Tourbillon World Timer Jean Todt was designed for Jean Todt, President of the FIA and former head of the Ferrari Formula One team, who presumably spends a lot of time aboard a private jet. 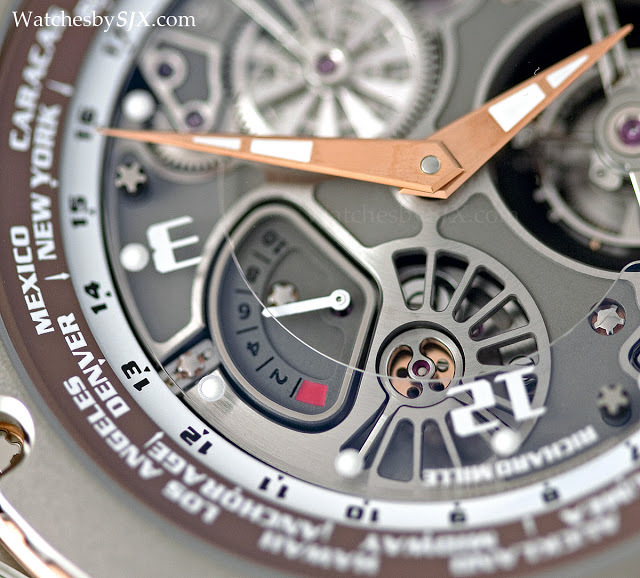 The world time is adjusted by rotating the bezel, which is linked to the hour hand, anticlockwise. 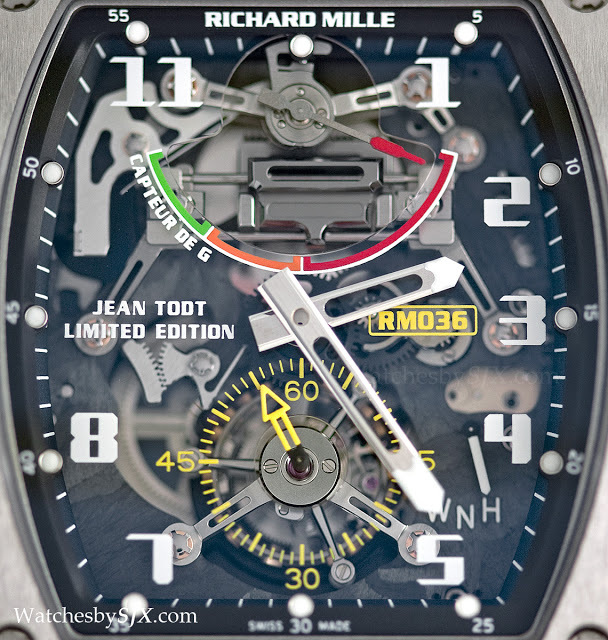 Mr Todt presumably has a very large wrist because the RM058-01 is 50 mm wide. 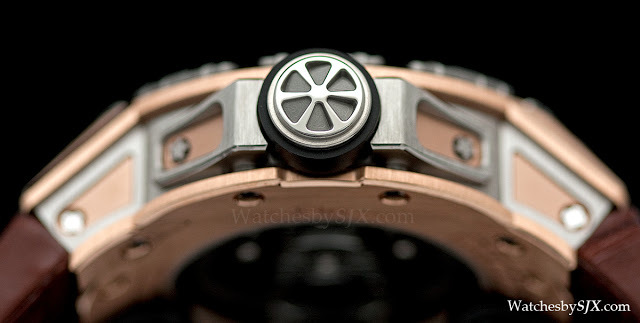 The case is rose gold and titanium. Only 35 pieces will be made. 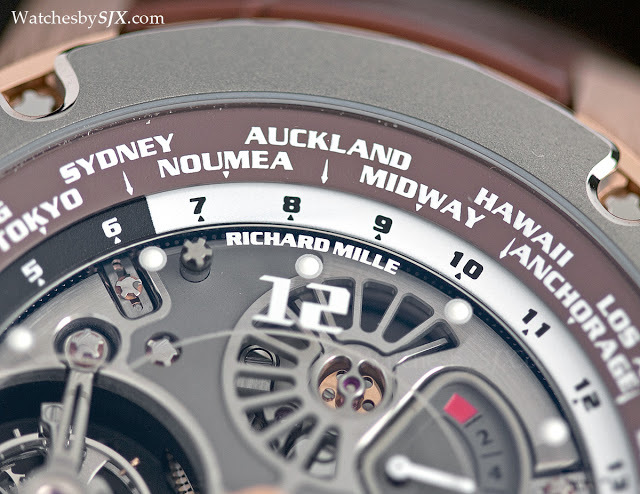 This is one more alternative for the private jet set, in addition to the Greubel Forsey GMT. 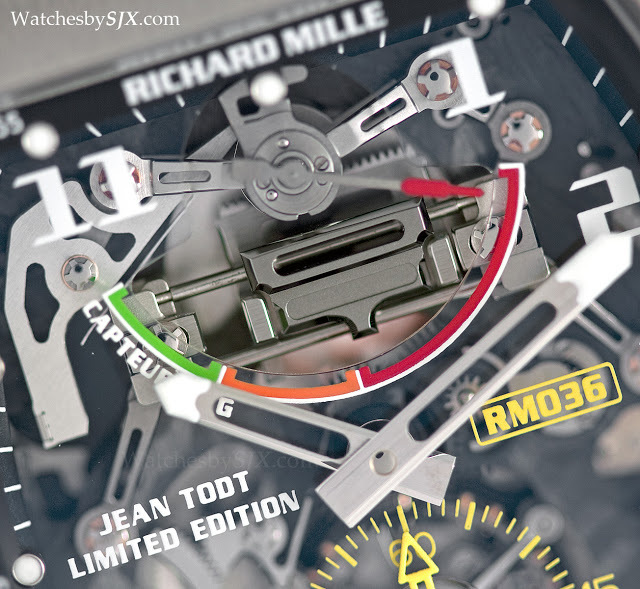 Also designed for Mr Todt is the RM036 Tourbillon G-Sensor Jean Todt. 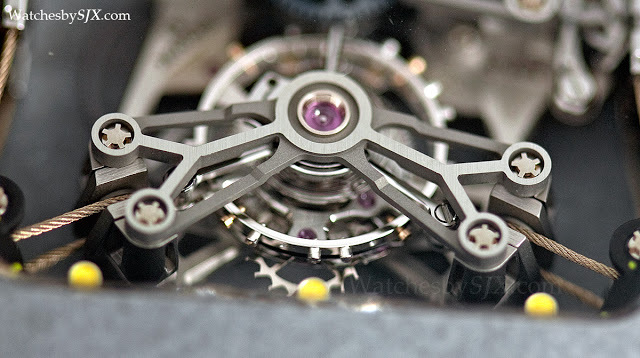 This is a manual wind tourbillon wristwatch with a G-force sensor built into the movement at 12 o’clock, visible through the dial. 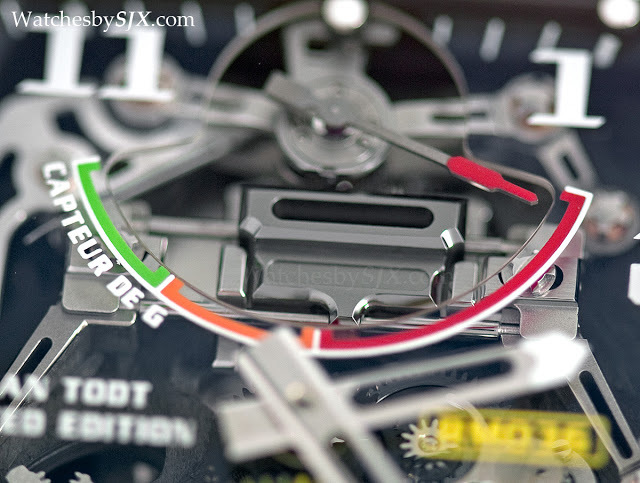 When the G-force indicator hand is in the green zone, the force on the wearer is safe; the red zone indicates an unhealthy amount of G force. 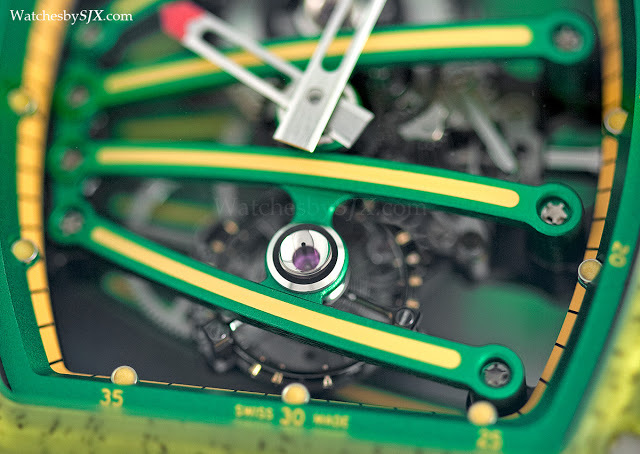 The pusher at nine o’clock resets the G force sensor. 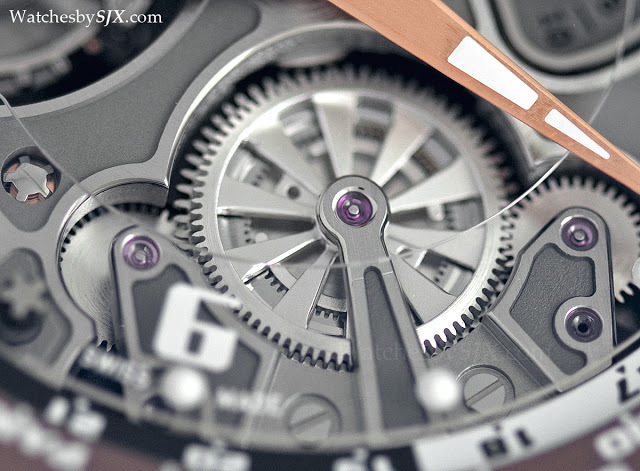 This is a limited edition of 15 pieces in titanium. 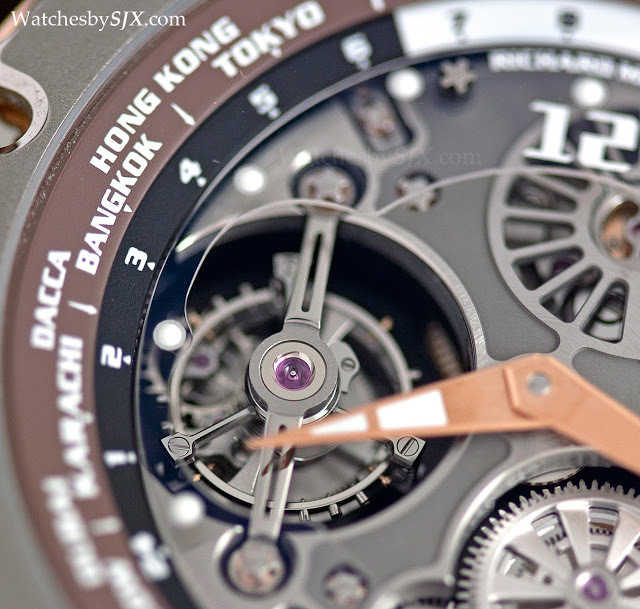 And finally for the most striking watch RM presented at SIHH 2013. 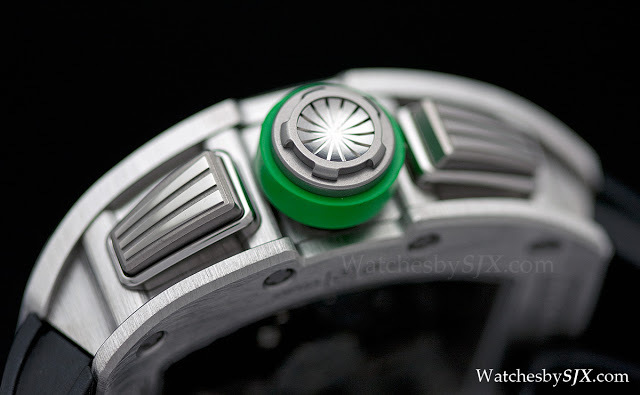 The RM059-01 Yohan Blake was made for Jamaican Olympic sprinterYohan Blake. 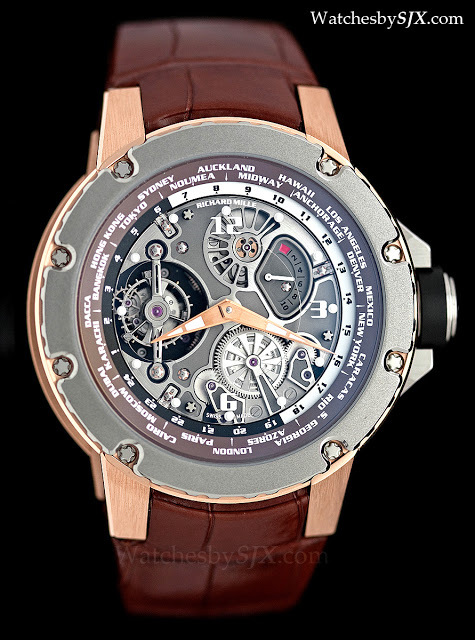 Unlike the earlier Yohan Blake watch that was a variant of an existing model, the RM059-01 is a new model that was designed in collaboration with Blake. 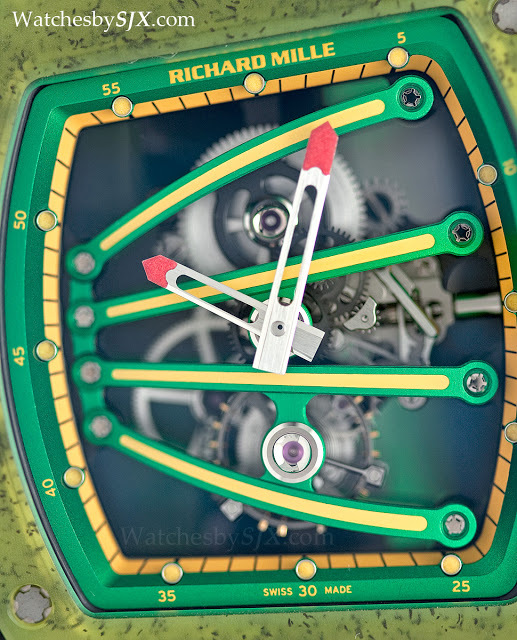 This is a striking watch – like the Nadal it is exceptionally lightweight – and almost comical in its colour. 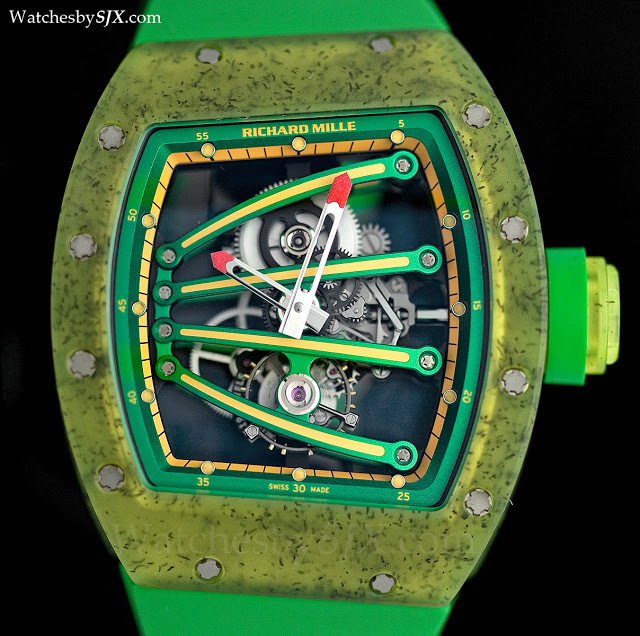 Coloured like the green and yellow of the Jamaican flag, the RM059-01 has a translucent polymer case injected with carbon nanotubes; the colour of the case is reminiscent of seaweed. 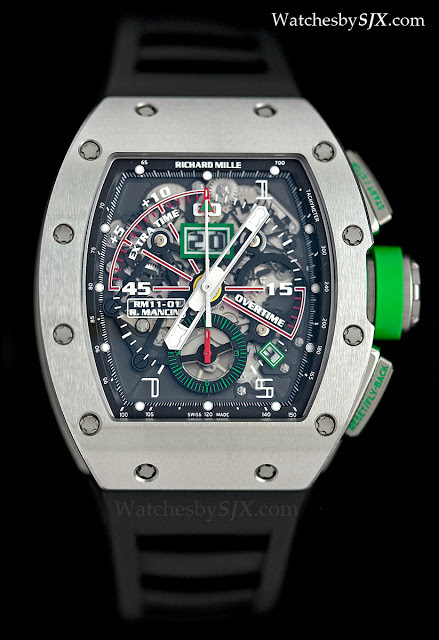 And unlike most tonneau RM cases, this one is asymmetric, mirroring the slope of the green aluminium bridges.